Welcome Rock Trails - Garston Southland NZ. Secluded Accommodation, Hiking and Biking! 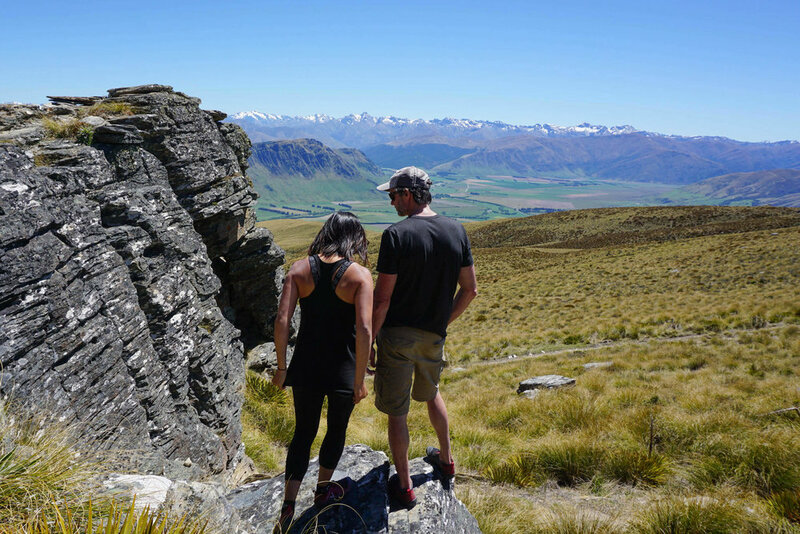 Located less than an hour south of Queenstown, Welcome Rock Trails is a private high-country station offering accommodation, hiking, mountain bike riding and amazing sightseeing. Our snowboarding season had just wound up down here in the Southern Hemisphere and we were looking for other adventures around this beautiful part of the world. Jen learnt about Welcome Rock Trails awhile back and we knew it was a place we wanted to visit. Welcome Rock offers a 27km mountain bike trail, 21km of which is hand built single-track. The property and outlook are amazing, with 3 choices of high-country secluded accommodation as well as on-farm accommodation. Apart from mountain biking, you can hike the shared trails as well so you don't have to be gifted on two wheels to enjoy this area. I recently wrote about the mountain bike trail, which includes a video highlighting this awesome single-track. Jen interviewed the owner, Tom, who gives a brief history of the property and the surrounding area. Check out the fun interview below! Built on a property that provided water for the 19th Century gold mining community around the Garston area, the historic significance is celebrated in many ways. There is a restored mud hut, which you can sleep in (see Accommodation section below) that used to house one of the racemen who maintained the water race (hand built aqueduct), interpretative stops along the trail and remnants of one of NZ longest historic water races, 'The Roaring Lion'. And the most significant historic landmark, Welcome Rock itself. Welcome Rock as its name would suggest, was a meeting place for early settlers to meet and trade. It's the highest point on the trail at 1130m. Be sure to look for the hidden whisky bottle to share a dram with your friends! With a little help from Tom, I managed to find the bottle pretty easily, which Jen captured on film. Tom then proceeds to show me how it's really done! Historic Ski Hut - the start of Welcome Rock's Roaring Lion loop trail. Built in the early 1930's, it was one of the country's first ski huts. In 1948 Coronet Peak became NZ's first commercial ski field and by the early 1950's the hut was all but abandoned. It is now maintained by the Department of Conservation. You can stay here overnight but it's very basic - contact the DOC for further information. Nokomai View Point - this is the southern point of the trail, overlooking the area where gold was first discovered in 1862. The Roaring Lion water race, which the trails joins just after the Nokomai Veiwpoint, took 30 men 3 yrs to build in 1898 and was 47kms long! You'll cross Welcome Creek, which was used to channel water in the water race, before climbing 100 metres to The Roaring Lion iron art. The art is dedicated to the volunteers who helped bring the Roaring Lion back to life. The Flumings - the 30 erected shovels along the race berm symbolises the hard work each man endured back in the late 19th Century. Be sure to check out the relics in the treasure chest. Lee Hum's Hut - the remains of one of the four racemen huts. Cart Corner - an old cart remains at the last interpretation display, telling the story about the road workers who built and maintained the Nevis Rd. There are 4 different places you can stay at Welcome Rock, each offering quite different experiences. We stayed the night at Slate Hut which is located very close to the Welcome Rock. This modern hut has an outdoor cooking area, outdoor bathtub and amazing views of the Garston and the Mataura river. TAKING IN THE VIEW OVER THE VALLEY. ON THE DECK OF THE SLATE HUT, ENJOYING A COLD BEVERAGE AFTER A HARD DAY OF MTB RIDING AND HIKING! If you want an authentic gold rush experience, be sure to check out the Mud Hut. Restored in the 1990's, you feel like you're stepping back into the 19th Century as you walk in the door. Refresh yourself in the outdoor bathtub before sharing stories of the day's riding around the open fire place. Beautiful views over the Nokomai river valley. Fancy getting even further away from it all? Then stay in The Tent! Also overlooking the Nokomai River Valley, the large canvas tent is perched on a small terrace. The adjacent Welcome Stream and outdoor shower will ensure you'll be recharged after your day of hiking or riding. The Red Shed is part of the old wool shed that has been converted into a self-contained studio apartment. If the idea of 'roughing it' doesn't quite appeal then return to you own ensuited room after a hard day of hitting the trails. Located near the homestead below Welcome Rock Trails, you'll enjoy the peaceful farm view from the outdoor area. We had a really enjoyable weekend at Welcome Rock Trails. The mountain biking was awesome, the views spectacular and it was a great feeling to get away from it all. Check out our short compilation video from our weekend at Welcome Rock Trails. For more on the mountain biking trail, check out our previous post and video on Mountain Biking at Welcome Rock. This place comes highly recommended and if you have any questions, please leave a comment below! Welcome Rock Trails is a private MTB area that offers a 27km loop in the alpine high country near Garston, Southland NZ. If you want to experience kiwi wilderness at its finest, grab your MTB and head to Welcome Rock! Cardrona Mountain Biking - Awesome Riding at the Cardrona Bike Park, New Zealand. Are you visiting Queenstown or Wanaka for your mountain biking holiday? Be sure to add riding at Cardrona Alpine Resort to your itinerary. With alpine riding and unique terrain, it's a favourite of mine whenever I'm heading out for some downhill MTB action!